The annual scourge is upon us, as tens of thousands of attention seekers descend on Las Vegas for the Consumer Electronics Show. Nowhere else can you watch bloggers and journalists in a constant chase of their public relations foibles, who desperately hunt for all the attention they can get their clients. Think a thousand kids in a small room, calling for mommy and groping her dress. Then multiple ten times. My last CES pilgrimage was 2008. That’s right, I haven’t gone in 10 years. No-o-o-o regrets. Nothing important ever comes out of the show, even though each year the hype suggests otherwise. Most new unveiled products won’t ship until second half of the year. If ever. There’s more vaporware at CES than hot air—and that’s no easy feat. Surely the Las Vegas Convention Center installs extra carbon dioxide scrubbers so that participants don’t asphyxiate. If there was an alarm for toxic babble, it would sound incessantly. 2. Ask Alexa. In classic Christmas movie “It’s a Wonderful Life”, Zuzu Bailey says “every time a bell rings an angel gets his wings”. Every time you ask Alexa, Amazon CEO Jeff Bezos is five dollars richer. Who wants to mint a billionaire? 3. Binge-watch “Black Mirror”. This dystopian view of your technology future is the perfect cure-all to the CES dog and pony show. The new things are the ponies paraded by PR flaks. Bloggers and journalists are the dogs nipping for a bite. 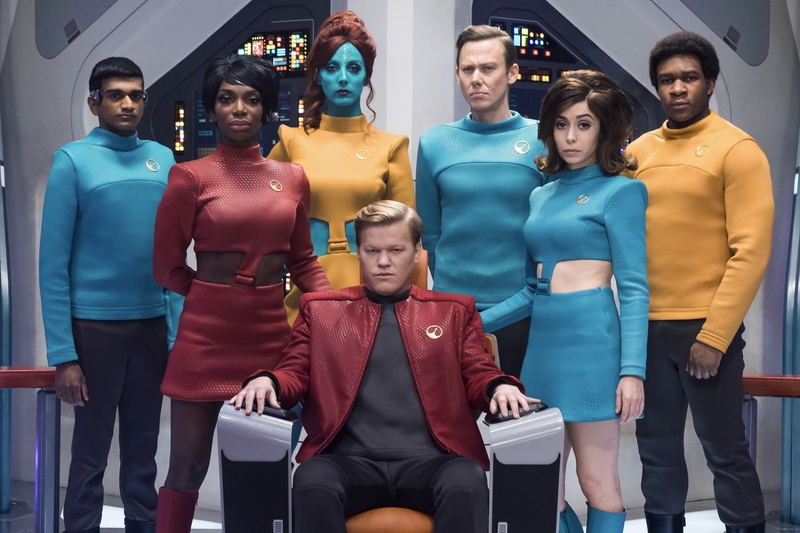 Anyone mentally strong enough to watch all four “Black Mirror” seasons back-to-back may experience technophobia leading to the selling of all their belongings and moving to a secluded cabin in Alaska. Netflix cancelled. Facebook and Google accounts purged. Smartphone flung out the window. Computer crushed under the car wheels. Do bring along some paperback books to read! 4. Write a Twitter novel. Now that Twitter allows 280-character tweets, the opportunities are endless. Do you really think that members of the Trump Administration were stupid enough to give Michael Wolff unfettered access? Let’s be sensible. Public and private tweets were all he needed to write Fire and Fury. You, too, could be a New York Times bestselling Twitter novelist and complete your populist masterpiece before any of the major doodads announced at CES this week ever ships. Are you truly ambitious? We believe you could complete the award-winning tome before the last booth babe collapses, after the show closes. 5. Unfriend somebody. Confess. You hate Facebook? What person of any marginal intelligence wouldn’t? Even President Trump knows enough to prefer Twitter. You may not like his company, or want to admit that he’s right about anything, but if he’s smart enough to tweet rather than like shouldn’t you be? Celebrate CES, and your Facebook loathing, by unfriending somebody. Start with that annoying high school nerd or your Aunt Marge, who fills your newsfeed with pointless platitudes and cat videos. Unfriending is deeply satisfying, and you’ll wish you had more friends as you send silent “piss-offs” faster than Las Vegas gamblers can pull slot-machine levers. 6. Play a board game. Do a favor for your real friends—assuming you have any (We presume friendless nerds are grubbing for CES news and not reading this post). Invite your buddies to play a board game—something traditional that takes time, like Monopoly or Risk. They won’t understand the given gift immediately but they will later profusely thank you for getting them off the CES-announcement treadmill, which isn’t far removed from hamsters running wheels to nowhere. 7. Hookup with somebody. If you’re married or living with a partner, have you touched them recently? Contact is the first step to intimacy and to having the S-word (We don’t use it to avoid some middle school with Chromebooks from filtering-out this important list). Perhaps you have a F(bleep, bleep, bleep) Buddy whom you occasionally meet. We can think of no better activity that will make your life better, and that of the other person’s, right here and now. You don’t need some antisocial, pimply-faced Silicon Valley nerd selling you promises of future aspiration when it can be yours today. You already have all the booth babe or hall hunk that you need.